Well it was pointed out that i havn't done a build diary for the Swift conversion i'm doing for the missus so here it is. The mini itself didn't need anything cosmetic doing to it really but will get a re-spray next year when we have more funds. Ive been busy doing the subframe and its now on it 3rd alteration and this was the final revision and i'm happy with it engine goes in and out nice. So here is the progress so far. The only patch's i had to do. version 1 of the frame which required the side rails moving higher and out a bit to accomodate the pullies. i'll get some more shots of the subframe tomorrow when ive finished doing the engine mounts. These took most of the day after a visit from Steve earlier this morning got me going on the right track. The mini fan shroud has been turned around and ive welded some tabs on to fix it to the inner wing. whilst the engine is out i gave it a clean and replaced the timing belt and the clutch. i noticed a small leak on the oil pan as well so resealed this as well. Nobody will ever notice it's not an A series with the green cam cover "camouflage". Look forward to watching the rest of your build. Are you planning on anything special or is it going to be a standard G13B, hidden in a standard looking Mini? What inlet are you going for or have you managed to avoid bulkhead mods with the standard manifold? Standard inlet manifold but i'm having it shortened by 1" so i don't have to haack the car about. Looks like you haven't fitted a hydro slave cylinder as yet. Are you going to use std cast iron exhaust manifold or do you still need stainless steel flange? I got one here you said you want it. If you don't I just use it myself! Your diff cover might touch back of the subframe if you are to keep your exhaust manifold with in round front in current setup. Atchi its a bit of a budget build now so i'm using the standard cast manifold you might as well use the stainless one. The hydro slave is still on order but havn't even thought about it yet. 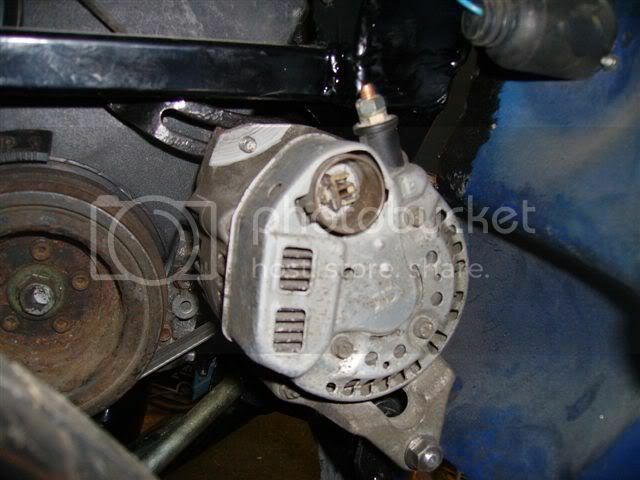 ive altered the subframe (version 2 i think) to take into account the diff. I removed quite a lot at the back of the subframe and welded in a bit more strength further back. I'll be doing all the little finishing bits tomorrow and spraying the subby and mounts. On a side note when i had got the engine in i thought i had better show Laurence so i went and got her. She said with a straight face.......'is it running'? Looking good, No one will ever see the rear mount, just get it painted, I used to love watching Fred Dibner. Does an oil filter goes OK? Your engine angle looks quite straight so your oil sump will be in wrong angle but I'm sure it will be alright. I'm not trying to picking your mistake, I'm just trying to tell you not to make same mistake as I did! Hi paul, This is a pick of phil's tie bar showing how tight the clearances are, hope this helps . Well back in the garage after an 8 month break for work Ive been working away in redcar for 5 of the months and didn't even step inside my garage for the odd day when i was home. No idea whats left to do as i really can't remember but i'll post updates as they happen. worth considering. Fit the plastic shield too? Choosing between being late or not starting at all; it's never too late!